The development of the ZX-1 Power Add-On has taken place over a period of 5 years. The design is patented in the US (Patent #8,430,189) with international patents pending. After extensive testing both internally and at outside test labs to RESNA standards, our company received FDA clearance to market the ZX-1 as a Class II Medical Device in May of 2013. 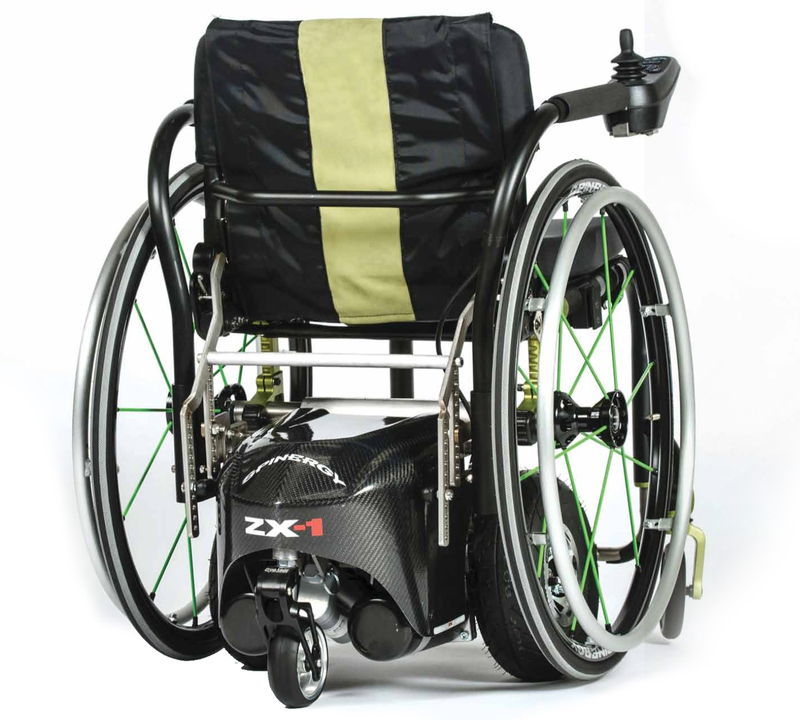 The ZX-1 is as robust as most power chairs on the market, but it only weighs 82 lbs. (37 kg.) and tucks underneath the wheelchair preserving the user’s original overall width. The ZX-1 also only adds about 3” (7.6 cm.) in length. Due to its compact size and weight, the ZX-1 is ideal for airline travel and for use within homes and spaces with narrow doorways. 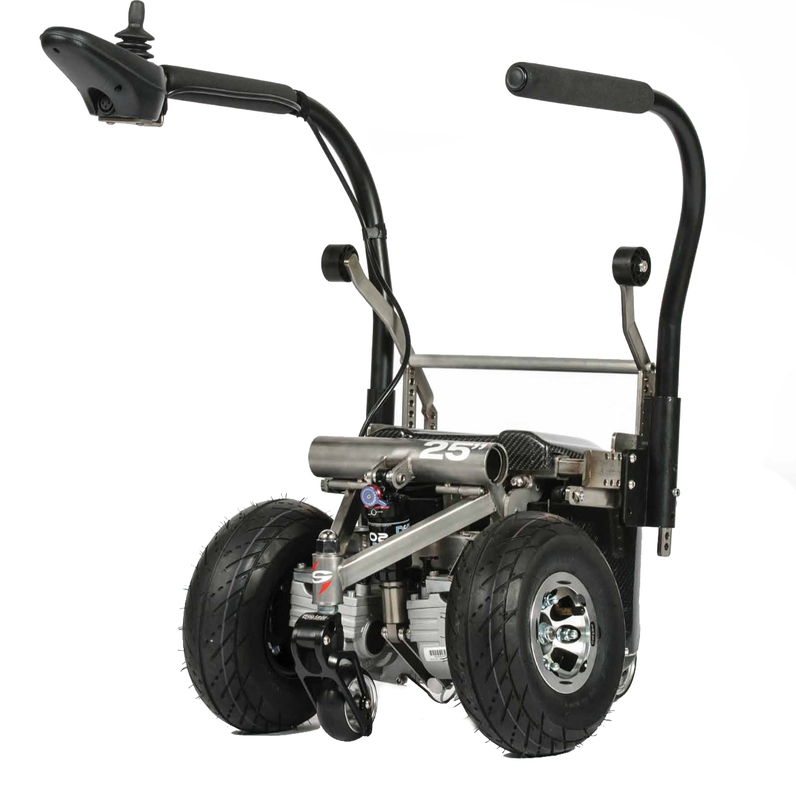 Since the ZX-1 lifts up the wheelchair rear wheels slightly off the ground, the user can remove their wheels off of the chair while inside their homes in order to reduce the overall width of the wheelchair by 6” (15.2 cm.) making it much easier to navigate through doorways or around furniture. The ZX-1 has an adjustable range for seat widths from 14” to 20” (35.5 – 50.8 cm.). 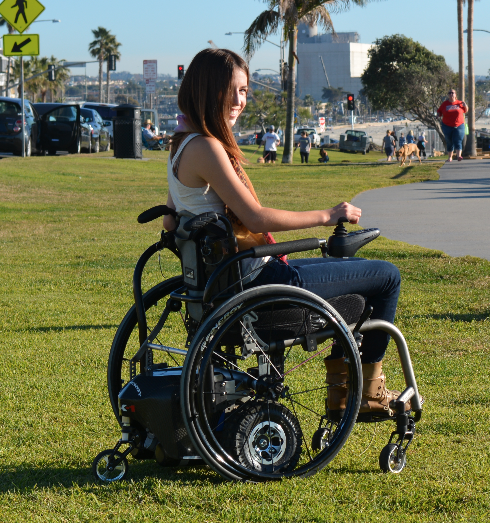 It can also adjust to different wheelchair wheel diameters of 24”, 25”, and 26” (540, 559, 590 mm.). The adjustability of the device simplifies orders for clinicians and dealers. Adjustability also allows for growth in the users’ wheelchair seat width, an important selling point to insurance providers because there is no need to purchase an entirely new device every time the wheelchair specs change. The ZX-1 includes an anti-tip safety system which provides stability and easy transitions over thresholds and curb cuts. The ZX-1 comes standard with two 12 Volt Lead Gel Mat Batteries that provide for a minimum range of 5 miles based upon a max occupant weight of 250 lbs. (113.4 kg.). Spinergy offers a Lithium Ion Battery option which extends the range to over 10 miles and reduces the overall weight of the device down to 75 lbs. (34 kg.). The Lithium Battery carries a 3-year warranty versus a 6-month warranty for the Lead Gel Mat Batteries. The stainless steel chassis comes with a lifetime warranty, and a 1-year warranty for all electrical components. The only maintenance items required are tires and maintaining adequate tire pressure.